Here are Mark Levin and Andrew Mc Carthy on Rush here. We are former federal government attorneys. We’ve collectively spent decades in law enforcement and believe passionately in its professional, non-political, non-partisan mission. Thus, it’s with outrage that we note that, rather than quietly dropping this embarrassment of an investigation, the state attorney, Barry Krischer—a politically active liberal Democrat—has insisted on filing a charge which he well knows will never be tried. Insisting, that is, on further media churning of an allegation of doctor-shopping that he’ll never prove. Law enforcement officials say Rush Limbaugh was arrested today on prescription drug charges. According to a spokeswoman for the State Attorney’s office, Limbaugh turned himself in to authorities on a warrant issued by the State Attorney’s Office. The spokeswoman says the conservative radio commentator came into the jail at about 4 p-m with his attorney Roy Black and bonded out an hour later on a 3,000 dollar bail. “I am pleased to announce that the State Attorney’s Office and Mr. Limbaugh ahve reached an agreement whereby a single count charge of doctor shopping filed today by the sState Attorney will be dismissed in 18 months. As a primary condition of the dismissal, Mr. Limbaugh must continue to seek treatment from the doctor has seen for the past two and one half years. this is the same doctor under whose care Mr. Limbaugh has remained free of his addiction without relapse. And the fall out of the case? Less security for our medical records? Whose Anthem is it Anyway? Hear it Here. The President of the United States say he thinks the National Anthem of America should be sung in English. Hear the Nuestro Himno here. The National Council of La Raza, a Latino advocacy group, agrees with Bush. “National anthems are sacred, and the United States’ national anthem should be sung in English and not altered in any way,” Lisa Navarrete, a La Raza vice president, said in an interview this afternoon. The president and La Raza part company, however, on the boycott scheduled for Monday. The president is opposed to it and La Raza is helping to organize it and supports the take over of part of the United States by Latinos otherwise known as the Nation of Aztlan. See my previous post and watch the produced video on Aztlan here (a real eye opener). Read more here in Michelle Malkin’s blog. Hear the whole thing song here. what we proudly hailed at twilight’s last fall? See this can’t happen, not only about the Latins. they can’t help where they were born. “There will be 2 to 3 million people hitting the streets in Los Angeles alone. We’re going to close down Los Angeles, Chicago, New York, Tucson, Phoenix, Fresno,” said Jorge Rodriguez, a union official who helped organize earlier rallies credited with rattling Congress as it debates the issue. 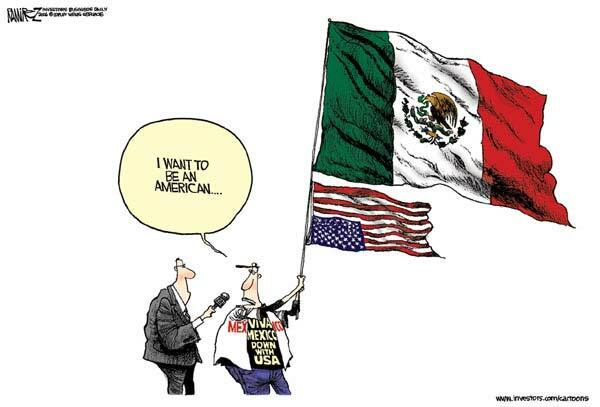 “We want full amnesty, full legalization for anybody who is here (illegally),” Rodriguez said. “That is the message that is going to be played out across the country on May 1.” They vow that America’s major cities will grind to a halt and its economy will stagger as Latinos walk off their jobs and skip school. Teachers’ unions in major cities have said children should not be punished for walking out of class. In New York, leaders of the May 1 Coalition said a growing number of businesses had pledged to close and allow their workers to attend a rally in Manhattan’s Union Square. Large U.S. meat processors, including Cargill Inc., Tyson Foods Inc and Seaboard Corp said they will close plants due to the planned rallies. “This is going to be really big. 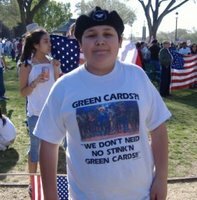 We’re going to have millions of people,” said Juan Jose Gutierrez, director of the Latino Movement USA. President George W. Bush named Fox News Radio host Tony Snow as White House press secretary on Wednesday in his latest move to shake up his staff and breathe new life into his presidency. Get the rest here. Check out Michael Barone’s piece today Here. who now admits to having unauthorized [read leaked] contacts with Dana Priest of the Washington Post among other reporters. It is believed, but disputed by her friends, that Mc Carthy handed over info and/or reports to Priest ostensibly showing that the US was running secret prisons holding Al Qaeda big wigs. Apparently holding Al Qaeda big wigs in prison is bad. That they’re secret is apparently bad, too. An oath to secrecy and ten year sentence if you tell secrets notwithstanding, apparently secrecy is a not so dearly held commodity at spook central. The Wall Street Journal’s editorial page weighs in today. The case of Ms. McCarthy appears to be as egregious as it gets as a matter of partisan politics. She played a prominent role in the Clinton national security apparatus and public records show she gave $2,000 to John Kerry’s Presidential campaign and even more to the Democratic Party. Such is her right. But rather than salute and help implement policy after her candidate lost, she apparently sought to damage the Bush Administration by canoodling with the press. There is little doubt that the Washington Post story on alleged prisons in Europe has done enormous damage–at a minimum, to our ability to secure future cooperation in the war on terror from countries that don’t want their assistance to be exposed. Likewise, the New York Times wiretapping exposé may have ruined one of our most effective anti-al Qaeda surveillance programs. Ms. McCarthy denies being the source of these stories. But somebody inside the intelligence community was. Clinton in 1998. Sadly enough, the same article concedes that McCarthy may have lied and then eventually told the truth about having unauthorized contact with members of the press. Well! In that case the remedy is clear. A special counsel must be appointed forthwith, to discover whether the CIA has been manipulating the media. All civil servants and all reporters with knowledge must be urged to comply, and to produce their notes or see the inside of a jail. No effort must be spared to discover the leaker. This is, after all, the line sternly proposed by the New York Times and many other media outlets in the matter of the blessed Joseph Wilson and his martyred CIA spouse, Valerie Plame. One can argue that national security is damaged by unauthorized leaks, or one can argue that democracy is enhanced by them. But one cannot argue, in the case of a man who says that his CIA wife did not send him to Niger, that the proof that his wife did send him to Niger must remain a state secret. If one concerned official can brief the press off the record, then so can another. A campaign that furthermore invokes the most reactionary law against disclosure this century: the Intelligence Identities Protection Act? It was obvious from the first that the press, in taking Wilson and Plame at their own estimation, was fashioning a rod for its own back. I await the squeals that will follow when this rod is applied, which it will be again and again. See Hitchens’ whole article here. Here is his reportage of the Niger meetings which Joe Wilson makes light of here and here. Thomas Josecelyn connects the Mary McCarthy dots here. Check out this conversation with the WaPo ombudsman here that is quite illuminating. Hey, it’s Friday and the secretary of state is trying to further dilute our votes by allowing vote by phone; so it’s time for a little levity. Here’s juggler man. Enjoy. OREGON INTRODUCES VOTE BY PHONE!!!! SALEM – Secretary of State Bill Bradbury has filed a lawsuit against Election Systems & Software, Inc. (ES&S), for breach of contract for failure to deliver the electronic voting machines that would allow people with disabilities to vote privately and independently. On January 10, 2006, ES&S informed the Secretary of State that it would not agree to the terms of the contract, and would not deliver the voting machines unless the Secretary changed the terms of the contract. Bradbury refused to alter the contract to meet ES&S’s demands, which then led to this lawsuit. “We will not leave our elections in the hands of companies that do not follow through on their obligations, and we will not be coerced into altering our contracts,” said Bradbury.